As the Kanzan cherry trees (Prunus ‘Kanzan’) in the Cherry Esplanade head toward peak bloom, the excitement is palpable—for good reason. Their deep pink, double blossoms, plus the central location of the esplanade have made this a favorite cherry cultivar of many visitors. But be sure to notice the variety of cherry trees in the Garden, too. The Prunus serrulata cultivars, for instance, are also heading toward peak bloom, including the fragrant ‘Taki-Nioi’ and as well as the ‘Ukon’, which features delicate flowers that change colors several times while in bloom. “They’re greenish when they open, then yellowish green, hence the name ukon which means turmeric in Japanese. 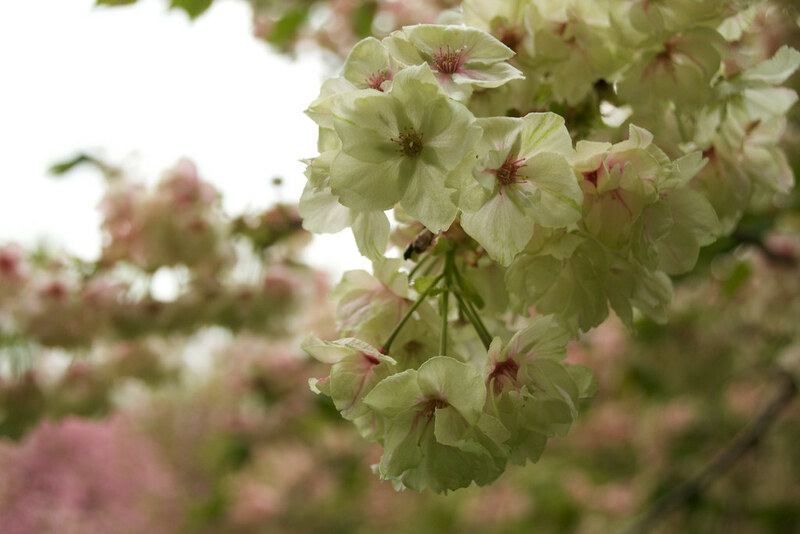 After that they turn white and finally pink,” says Brian Funk, curator the Japanese Hill-and-Pond-Garden. Specimens of each are in located there, a ‘Taki-nioi’ near the front gate, and two ‘Ukon’ near the upper waterfall. Check CherryWatch for detailed descriptions and locations of more cultivars. Why don’t you make it easy to view the cherry blossom chart, prebloom, peak bloom as an icon directly on the home page? I can never find it. Prunus serrulata 'Ukon' in the Japanese Hill-and-Pond Garden. Photo by Blanca Begert. Prunus serrulata 'Taki-Nioi'. Photo by Rebecca Bullene.